The benefits of eating a healthy breakfast have been well documented. But what are probably less well known are the reasons for eating a healthy lunch. Many of us are tempted to forego lunch thinking it’s not important or will aid us in weight loss. Nothing could be further from the truth. Lunch is an important part of any healthy eating plan. It helps to maintain energy levels during the day and avoid that mid-afternoon slump which hits at about 3.00 pm. The Mediterranean countries have the right idea. They have their main meal in the middle of the day then have an afternoon siesta. However we in the west tend to have our main meal in the evening, which means we need sustenance during the day to keep our energy levels up. Unless we plan ahead, lunch can be a real diet trap where good intentions can come unstuck. Office workers will often opt for the easy option of buying fast-food for lunch. Busy moms will often grab whatever is quick and easy. Mothers tend to put their family’s needs before their own. The result is often a less than healthy diet. But our healthy lunch recipes will make things easy and provide you with some great ideas. Skipping lunch altogether will make you feel hungrier and likely lead to either eating more than you normally would at the next meal or scoffing down a high-fat sugary snack mid-afternoon. Eating in the middle of the day re-energises our bodies and raises blood sugar levels, improving concentration. It has also been shown that regular eating boosts our metabolism which helps to burn food faster. Eating a healthy lunch is a great way to incorporate foods from the 5 different food groups and so get our recommended 5-a-day fruits and vegetables. It’s very difficult to get sufficient fruit and veggies if we skip meals. 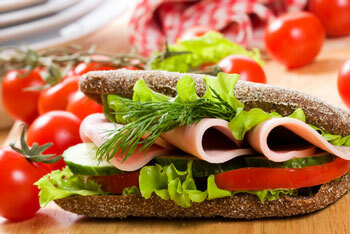 The ideal healthy lunch is one which combines food from each of the five food groups: i.e. complex carbohydrates, lean protein, fruit and vegetables and low fat dairy such as cheese or yogurt. With a little forward planning, it is possible to have a nutritious lunch, even when we are busy. Lunch doesn’t have to be a grand affair. Neither does it need to involve any cooking. A healthy and nutritious lunch, that covers all the major food groups, can be quickly and easily put together. To save time in the morning pack your lunch the night before. Don't forget last night's leftovers. They make excellent lunch fillers the next day. Simply make enough for both meals.